Little satisfies more at the movies than the relatively cheap special effect catalyzed by putting together a couple of great actors and letting them (figuratively speaking) dance a lengthy pas de deux. 93 min. Music Box Films. Director: Roger Michell. Cast: Lindsay Duncan, Jim Broadbent, Jeff Goldblum. Little satisfies more at the movies than the relatively cheap special effect catalyzed by putting together a couple of great actors and letting them (figuratively speaking) dance a lengthy pas de deux. That's certainly the case in Le Week-End, a thinly plotted but richly acted travelogue that sends Jim Broadbent and Lindsay Duncan to Paris. As a couple getting reacquainted through the high-pressure front of travel, Broadbent and Duncan bicker, brood, and at times delight each other, with mostly believable rhythms for a long-term married couple on holiday. As Broadbent's Nick Burrows says to Duncan's Meg Burrows, "You can't not love and hate the same person, usually within the space of five minutes, in my experience." The pair means their Paris excursion to celebrate their thirtieth anniversary, a return to the place—if not the first blush—of their honeymoon. But being stuck with each other without the usual avenues of escape (a situation somewhat mirrored in the newly empty nest back home that publicly delights and privately concerns the couple) isn't quite so romantic as one might hope: it's just as much an opportunity for closely held thoughts to slip out, whether they be unshared considerations for one's life that affect their life together, wistful regrets, hurtful secrets, or long-simmering recriminations at last vented. This third feature-film team-up of director Roger Michell and screenwriter Hanif Kureishi (Venus, The Mother) again explores the cumulative effects of years on the individual and on relationships old or new. There's suspense in whether or not this relationship can survive these sudden bouts of honesty and the challenges that regularly spring up in front of them during their two-day sojourn in relationship limbo, including consideration of just about every possible permutation of their futures apart or together. many of these are occasioned by a chance encounter with Morgan (Jeff Goldblum, delightfully set at maximum ooze), a former Cambridge classmate of Nick's—now a smarmy, successful author—who invites Nick and Meg to a dinner party laced with unexpected provocations. All in all, Le Week-End may be a bit on the flimsy side, but it compensates with emotional resonance and a playful flexibility that extends from its tense opening banter, through alternating euphoria and disappointment, to its closing homage to the café scene in Jean-Luc Godard's Bande à part, the pas de deux made merrily literal but wisely ambiguous: a last dance or a flame rekindled? Music Box Films delivers a fine Blu-ray special edition of Le Week-End graced with excellent A/V specs and a few quality bonus features. Picture quality accurately depicts the filmmakers' visual design, with muted palette and a somewhat gauzy feel, intentional in its romantic rendering of Paris. The digital-to-digital image is rock solid and clean as a whistle, with able contrast. Unquestionably, this HD version offers considerably more detail and sense of depth than the standard-def equivalent can offer, making this best way to enjoy the film at home. The audio comes in two flavors: lossless DTS-HD Master Audio 5.1 and lossless DTS-HD Master Audio 2.0. If your home theater allows for surround sound, the former is clearly preferable for its wraparound ambience, but both tracks feature clean, clear dialogue (of primary importance here), subtle environmental effects, and full-bodied music. The feature comes accompanied by an amiable commentary with director Roger Michell and producer Kevin Loader that covers the bases of the film's production while peppering in lots of fun stories. 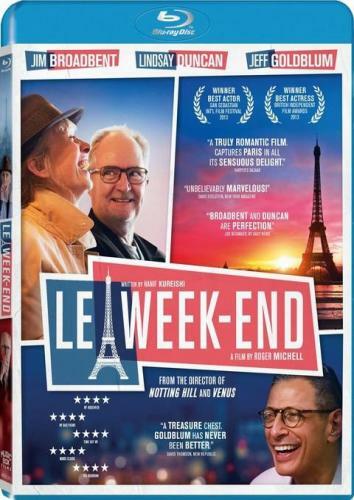 The featurette "A Weekend in Paris: Making Le Week-End" (15:40, HD) includes interviews with Michell and screenwriter Hanif Kureishi, Jim Broadbent, Lindsay Duncan, and Jeff Goldblum, as well as set footage. We also get Set Illustrations by Jane Webster (HD); "How to Dance 'The Madison'" (3:06, HD), which serves as quick tutorial and thematic commentary on the dance, and the "Theatrical Trailer" (2:11, HD). All site content © 2000-2019 Peter Canavese. Page generated at 04/24/2019 12:29:03PM.